Find the ideal trees, shrubs, roses, vines, groundco vers and perennials for all of your landscape and garden projects by searching through the thousands of plants this online encyclopedia has to offer. 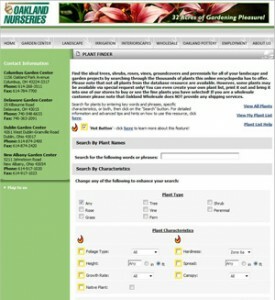 Please note that not all plants from the database resource are available. However, some plants may be available via special request only! You can even create your own plant list, print it out and bring it into one of our stores to buy or see the fine plants you have selected! If you are a wholesale customer please note that Oakland Wholesale does NOT provide any shipping services.